Bakong is the state temple of Indravarman I (877-886) at Hariharalaya (modern Roluos), dedicated to Shiva as Indreshvara ("Lord Indra," the personal god of Indravarman, whose name means "Protected by Indra"). This is a view of the west face, which is the "back" of the temple (the main entrance is east). Its base is a great five-tiered pyramid (closeup), 65m x 67m (214' x 220'), perhaps representing the five earthly realms of snakes (nagas), birds (garudas), demons (rakshasas), nature-spirits (yakshas), and kings (rajas). The original tower's fate is unknown; it was later replaced, possibly by Yasovarman II (1150-1165), by an incongruous tower in Angkor Wat style which sticks up like a sore thumb above the much earlier base. The temple is surrounded by eight subsidiary towers, two of which are seen in the photo above. Most reliefs on the base are damaged, but one scene on the fifth level is an icon of southeast Asian art. 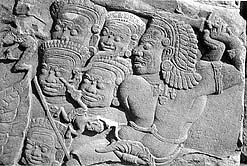 It shows a group of asuras (demons) who are fighting a losing battle; their battle-standard has just been sliced in two, and its finial (the small figure in the photo) is toppling down. Its style is influenced by Javanese art.